This cooks in about 45 minutes. A tasty weeknight meal you can serve with sandwiches – perhaps grilled cheese with bacon or tomato. Get all the ingredients ready and onto the counter. Into the pot you’ll be making this soup, place the 3/4 cup water, bring to a boil then add the onion. Boil steadily for 3 minutes, then add all the rest of the ingredients up to the ditalini (you’ll add that later). Bring to a boil again, then simmer on med-low for 30 minutes. Add the ditalini, bring to a boil, simmer for 15 more minutes. Oh, how I love homemade soups! 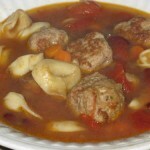 This one is especially good and hearty. You can alter it and use ground beef and/or ground pork instead of the turkey. First, make the meatballs: preheat oven to 350 degrees and lightly grease a large, rimmed baking sheet. Into a medium bowl, lightly beat the egg, then add the meat, breadcrumbs and spices. Mix gently but well and form into small meatballs – I usually get about 20 of them. Place on the baking sheet and bake for about 20 minutes. Now, start the broth: Into a soup pot, place the oil and butter and heat over med-high heat, add the onion, carrot and celery and cook for about 10 minutes, until soft. 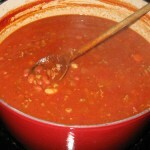 Add the broth, 2 cups water, beans and tomatoes; bring to a boil then turn down to simmer. When meatballs are done, drain them if needed, then ad d to the broth, sprinkle some ground black pepper in – about 1/4 tsp. then bring back to a good, steady simmer for 30 minutes, gently stirring occasionally. Add the tortellini, bring back to a boil, then cook as package directs. 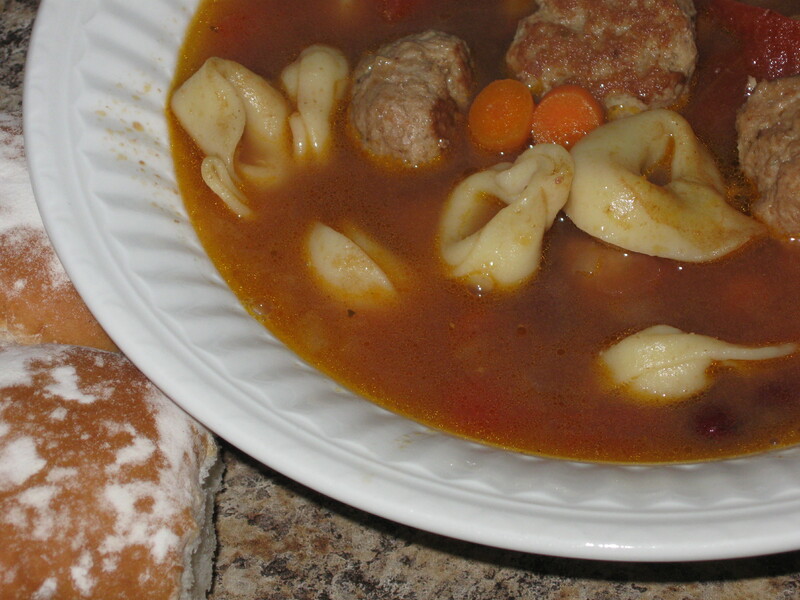 When the tortellini is done the soup is done. Ladle into bowls and eat! Ah, what to do with that leftover bird. I make it a rule to never go out shopping the day after Thanksgiving – instead I hang out at home make this soup for leftovers. Let others shop, I cook. 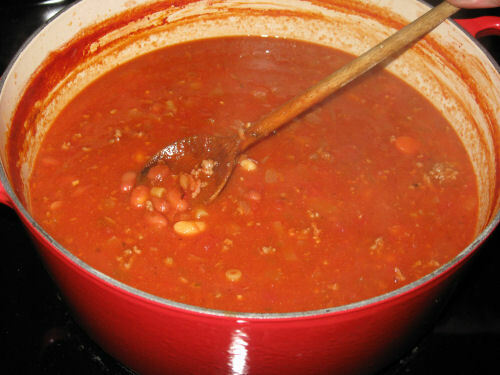 In a large pot bring the the first 6 ingredients to a boil, lower heat to a simmer and let cook for 20-30 minutes. Now add everything else except the noodles, and keep this simmering for another 10 minutes. Add the noodles, bring to a boil and simmer for about 10 minutes. It will continue to cook as you prepare the roux, below. 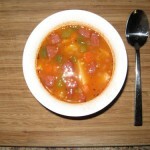 Keep the soup at a low simmer while you spoon off 3 cups of clear soup – do this as best you can and set aside. Then into a medium pot melt the butter and add the flour, stirring constantly while it cooks for at least 1 full minute. Slowly add the 3 cups clear soup – just a little at a time – and stir constantly on high heat until it gets thicker and thicker. The goal here is to create a very smooth pastelike roux. Mix this into the soup, while stirring and stir well. Place everything in a pot, cover and put in the oven for 3 hours. The only thing you have to do is stir occasionally (perhaps twice) and then serve. I’m so lazy sometimes but it works! Preheat oven to 350 degrees, place everything in an oven-proof pot with lid, or cover with foil, combine well then place in the oven for 3 hours, stirring once or twice. Serve. 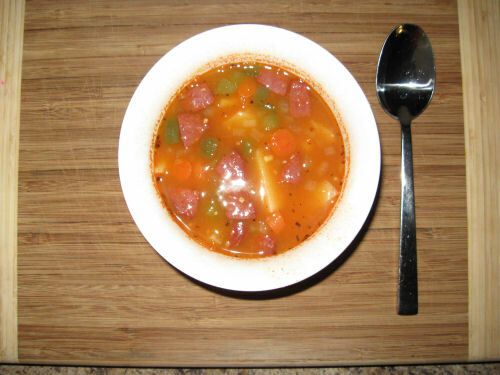 When I think of an exotic soup, this one comes to mind. Add olive oil to a large pot and when it is hot add the onions and saute them over medium heat for 5 minutes. Add carrots, stock, water, ginger and bring to a boil, lower heat, cover and simmer for 45 minutes. Add all the rest of the ingredients up to the garnishes and cook for 5 minutes uncovered. 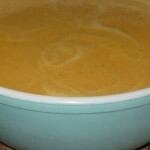 Puree the soup in batches in a food processor or blender. Don’t let it come to a boil when you preheat it. This is my version of pasta e fagiloi. Delicious, simple, easy to prepare. The ingredient list may seem long, but it’s stuff you probably already have in your kitchen, except maybe the V-8 juice and meaty ham bone. 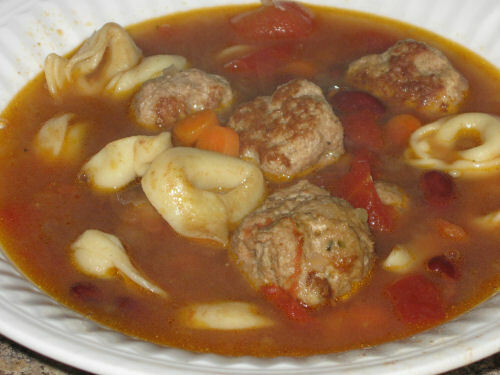 Remember, you can prepare the pasta separately, add to the bowls then add this soup – it’s up to you. 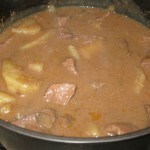 In a large pot, brown meat and drain off almost all of the fat. Place back in pot and add the onion, carrot, celery and garlic and saute for 10 minutes. add all the remaining ingredients except the pasta and bring to a boil. Lower heat to a simmer and simmer for 2 hours, stirring occasionally and adding another cup of water if it seems to thick – remember, when you add the pasta it thickens up. During the last 20 minutes, remove the ham bone, add pasta, bring to a boil then simmer until pasta is done. No need to wait until Super Bowl Sunday. This stew simmers for a nice long six hours; the intoxicating aroma will have everybody hovering over the stove. Place the beef on a plate and sprinkle on the white pepper and salt, rub in all over the cubes. Set aside while you get out a soup pot or dutch oven; place the butter in and melt over medium heat. 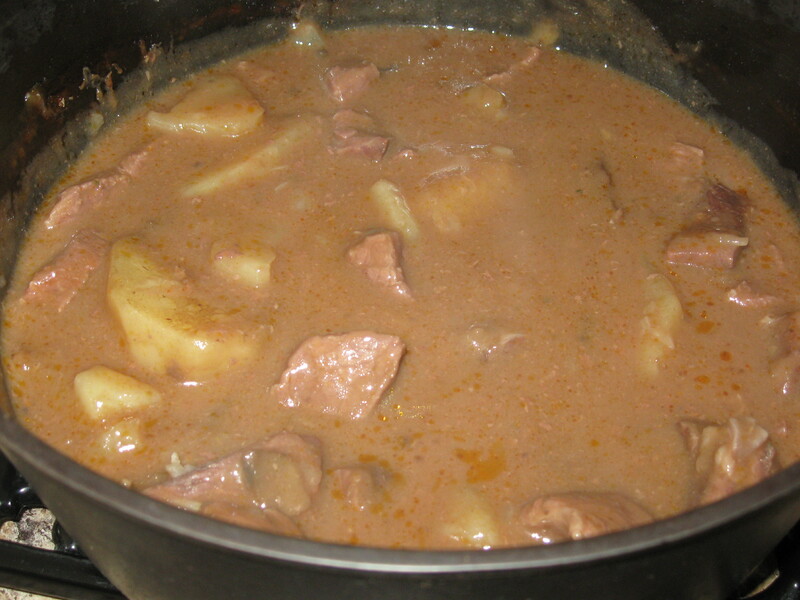 Put meat into the pot and brown on both sides – 5 minutes each side. Add everything else to the pot except the orzo if using – (If you simmer orzo for 6 hours it will be mush). Bring to a boil and then lower to a simmer and partially cover. Check and stir during the 6 hours, adding water as needed – depends on how thick you want it. If using orzo pasta, add it the last hour.